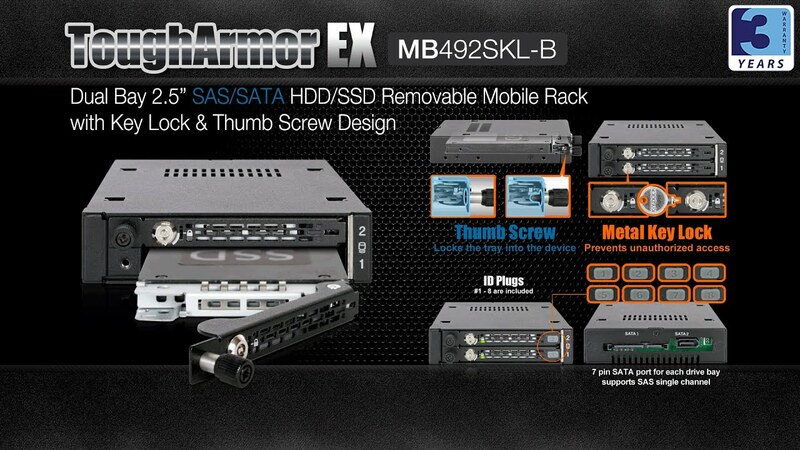 The ICY DOCK ToughArmor EX MB492SKL-B dual bay 2.5” mobile rack is built specifically for industrial small form factor systems that require exceptional drive security. It uses a rugged heavy duty metal construction, which is considered to be compliant with flammability requirements and is capable to withstand the harshest environments. The metal key lock prevents unauthorized access your important drives and the thumb screw lock adds extra protection from impact, and reduces drive tray vibration which increases drive stability during transportation. Our removable drive tray allows interchangeability of data between multiple systems. The removable drive tray design supports hot-swap and makes maintenance completely hassle free which is extremely beneficial in the case of a hard drive failure. It reduces overall down time which is precious for time sensitive applications. The trays are also designed to accommodate 5 to 9.5mm height hard drive and SSD, creating dual 2.5” hot swap bays for any standard SATA/SAS hard drives and SSDs. The front of the ToughArmor EX includes a status LED when the drive is powered on, off and being accessed.. Active Power Technology (APT) allows the status LED to be on only when a hard drive is inserted into the enclosure. We have also included drive ID plugs so user with multiple MB492SKL-B units in their system can give each drive tray a unique ID number. Ensuring the material used can be relied upon for many years after its deployment, the MB492SKL-B is capable of holding up in the harshest environments, with rugged heavy duty metal construction throughout the entire device. The ToughArmor EX’s full metal design is perfect for industrial devices that may require a flammability rating since all-metal already complies with flammability requirements. Because of the high build quality, it can be used in various enterprise systems including: military and law enforcement deployment. It can also be used in manufacturing conditions such as embedded control systems and factory automation systems such as: military and law enforcement deployment.